A smoking lawn mower is never a good sign. Whether the smoke is blue, white, or black, here's how to identity and address the issue without the help of a professional. Q: Recently, my mower started billowing smoke when I powered it up, so I shut it off immediately. Why is my lawn mower smoking? And is it a fire hazard? I want to know how to proceed so I don’t harm the machine. A: Your lawn mower can emit smoke for numerous reasons—many of which don’t require the services of an expert. A homeowner can usually identify the reason for a smoking lawn mower by gauging the color of the cloud coming around the engine, then fix it accordingly before lasting damage occurs. Keep in mind that all mowers with internal combustion engines contain the same basic parts, but the configuration of those parts varies widely, depending on manufacturer and model. Consult your owner’s manual if you’re unsure how to access a specific part of your lawn mower’s engine. White or blue smoke may indicate an oil spill on the engine. If you’ve recently changed the oil in your mower and the engine is emitting white or blue smoke, it’s possible that some of the oil spilled onto the engine. Similarly, you could’ve spilled oil on the engine by mowing on a slope greater than 15 degrees or tipping the mower on its side. The smoke may look disconcerting, but it’s completely harmless. Solve the problem by restarting the mower and allowing the spilled oil to burn off. If you tip the mower often for cleaning or maintenance, check your owner’s manual to determine the best way to reduce the risk of oil leaks. An overfull oil reservoir may also cause white or blue smoke. Ensure you didn’t overfill the mower by checking the oil level with the dipstick located on the reservoir. To do this, remove the dipstick cap, wipe off the stick with a rag, and reinsert it into the reservoir. Then remove the dipstick once again and determine the oil level in comparison to the recommended “fill” line on the stick. If the level is too high, drain the oil (consult your owner’s manual for instructions), then refill the reservoir with it. Start checking the oil level with the dipstick after you’ve added about ¾ of the amount recommended in the manual. Continue to add small amounts of oil until the level matches the recommended “fill” line. Also note that using the wrong grade of engine oil may cause blue or white smoke. Consult the owner’s manual for the exact type of oil recommended for your mower. Black smoke may indicate that the mower is “running rich,” or burning too much gasoline. 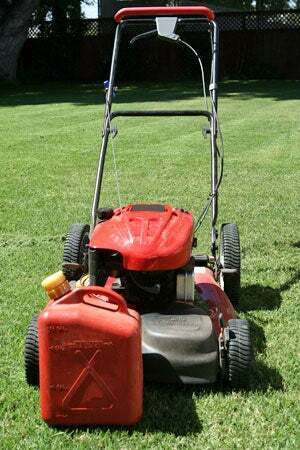 Your lawn mower’s carburetor regulates the ratio of gasoline to air mixture. If the carburetor isn’t getting enough air, the mixture has a higher percentage of gasoline, which can create black exhaust smoke. It’s possible that a dirty or clogged air filter is preventing sufficient airflow into the carburetor. Try replacing the air filter, then running your lawn mower for a few minutes. If the black smoke still appears, the carburetor might need to be adjusted in order to increase airflow. Either take the mower to a professional or adjust the carburetor yourself with instructions in your owner’s manual. Take your mower to a repair shop if necessary. 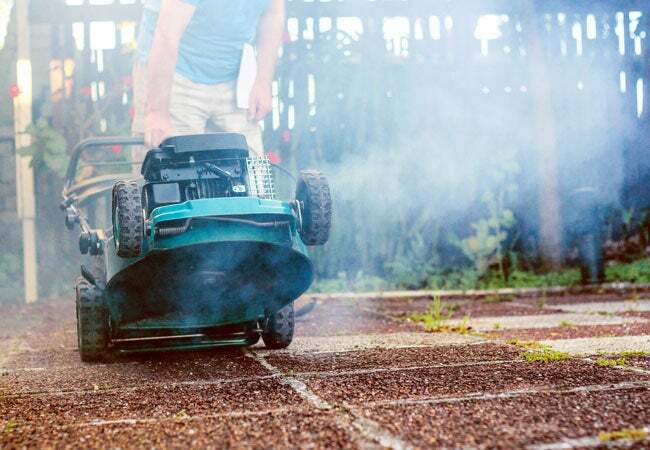 If the previous steps don’t correct blue or white smoke, your mower could have a more serious problem, such as an air leak in the crankshaft (the cast iron or cast aluminum case that protects the moving parts of a mower’s engine). Continuing blue or white smoke could also indicate that some of the engine’s components or seals are worn out and need replacement. Similarly, if black smoking still persists after you’ve replaced the air filter and adjusted the carburetor, you could be facing a more serious mechanical issue. All of these problems require the help of a professional. If your mower is still under warranty, check with the manufacturer for the location of the nearest servicing dealer; problems stemming from a factory defect or poor workmanship may garner free repairs. If your mower is not covered under warranty, a reputable small-engine repair shop should also be sufficient to get the job done.